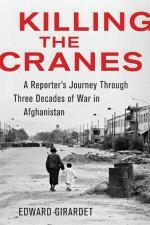 Just finished a fascinating book by Edward Girardet entitled Killing the Cranes: A Reporter's Journey Through Three Decades of War in Afghanistan. When the author first came to Afghanistan, he was a young reporter out to make a name for himself. There were rumors that the Soviets might be invading so Girardet stayed around. After covering the Soviet war and pull out, he then covered the lesser known civil war between Communist and anti-communist forces for control of the country. In the book he offers the reader a perspective on Afghanistan that is lost to most Americans and never understood by politicians. For example: while other countries have attempted to invade this nation and impose their own vision of a national government, Girardet points out that Afghans, for the most part, don't care about a national government. They are loyal to their tribe and the last strong ruler of Afghanistan held only a limp grip on the nation as a whole. He speaks of the amazing hospitality of the Afghan people: how long it takes to travel anywhere because each village welcomes you to tea and biscuits even though many are very poor. It is a custom to welcome visitors, even ones they may not like. To do otherwise would be rude. There is a saying in Afghanistan: you can rent and Afghan but you can't buy him. The Afghan people are a fiercely independent people who don't mind outside help with their problems but they do mind countries trying to impose their vision of what Afghanistan should be. He writes of America and the huge political failures we have made in backing the wrong polticial and military leaders simply because they spoke English. He writes that America must learn the same lessons that the Soviets, the British, and many others have: a military solution is not possible in Afghanistan.